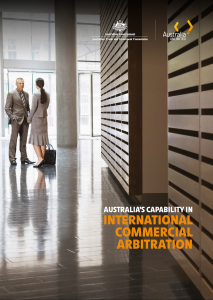 In April 2018 the Australian Trade and Investment Commission (Austrade) released an International Commercial Arbitration Capability Report outlining Australia’s offering of world‐class international dispute resolution services and expertise to promote global trade, safeguard commercial relationships and manage risk in cross‐border investment. Download your copy of the report from the Austrade website. For hard copies of the report, please contact the ACICA secretariat on +612 9223 1099.